Sometimes you have to push the culinary envelope. 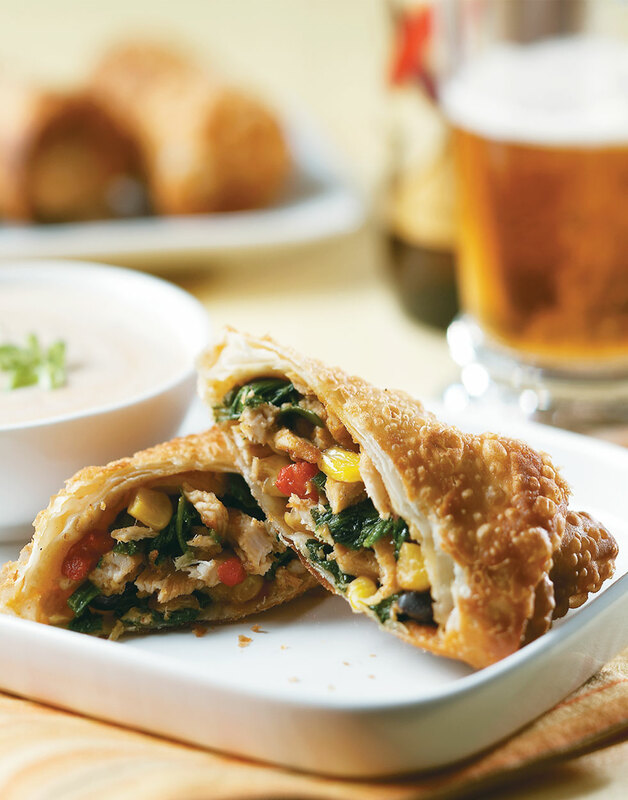 East meets Southwest in this funky Tex-Mex version of an egg roll. It's simple, fun, and a great way to use up turkey leftovers. Sauté turkey, cumin, chili powder, garlic powder, and onion powder in oil in a large nonstick skillet over medium-high heat for 1 minute. Stir in spinach, corn, beans, sweet pepper, scallions, and jalapeño. Cook until spinach wilts, about 1 minute. Off heat, add cheese and salt. To assemble, lay an egg roll wrapper on a work surface with a corner toward you; brush edges with egg wash. Place 1/4 cup filling on wrapper and fold bottom corner over filling, tucking tightly; fold in sides and roll to the end. Repeat with remaining wrappers and filling. Stir together all ingredients for the dip. Heat 2 cups vegetable oil to 350–360° in a large sauté pan over medium-high heat. Fry egg rolls until crisp, about 5 minutes; drain them on paper towels. Serve egg rolls with dip. Add cheese to the filling off heat so it doesn't melt completely. Let filling cool slightly before rolling. Place filling on wrapper 1 inch above bottom corner. Fold bottom over filling, fold in sides, then roll.